Honestly, what’s more fun than watching a dog sleep? They move their legs and sometimes utter tiny barks or growls. We all stare on and say “awww they’re dreaming!” But what do they dream about? 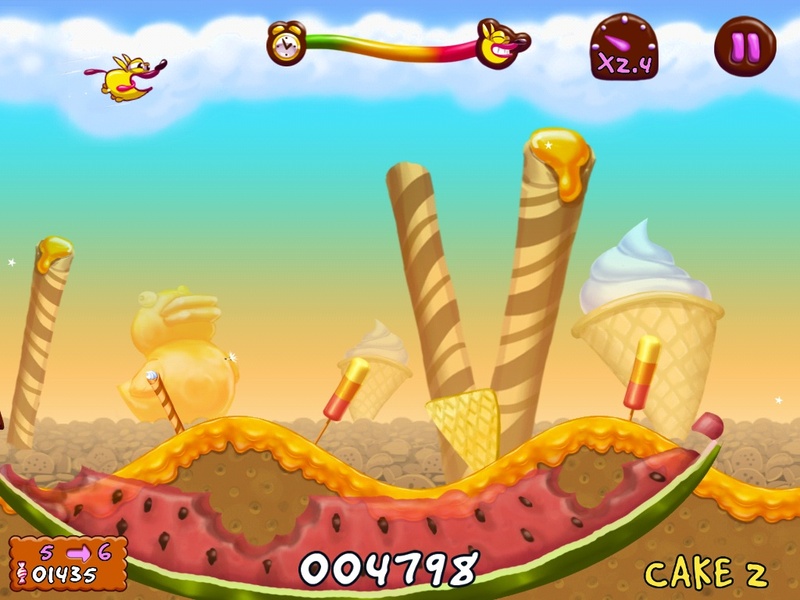 Sugar High is a game about one dogs dream to feast on as much candy, fruit and cake as possible. Small iOS developers, Shortbreak Studios, have created this delightful little treat, fusing an original story, simplistic mechanics, easy to use control systems and topping it off with pleasantly unique visual style. It’s always nice to see an original story on the iOS market. Shortbreak have created a casual game that has a well integrated story. Although it may may not directly impact on the gameplay itself, it is framed in such a way that it creates a rather enjoyable experience. The story is an optional element to the game that can be accessed through the main menu. It’s told through animated comic-book style panels. A small adorable dog salivates and stares at an empty bowl, before slowly walking off to nap in the wait for dinner. In it’s dreams, the dog visits a huge land of candy, with vast amounts of cake, lollies and fruit. The option to watch the story voluntarily at first seemed like a bit of a waste, but given the casual nature of the game, it makes sense. This way players are not confronted with the story over and over again and can dive straight into a world of cakes and candy. Mechanically, Sugar High is not the most original. However, this does not mean the game isn’t well executed. The game is reminiscent of that popular iOS title, Tiny Wings. The character, in this case a hungry dog, travels down and up slopes, flying into the air and collecting items along the way. The game is controlled with a simple touch and release input, that is rather easy to pick up. The physics and basic mechanics both work well, but like I said, are not the most original. Yet, that’s not all Sugar High has to offer. 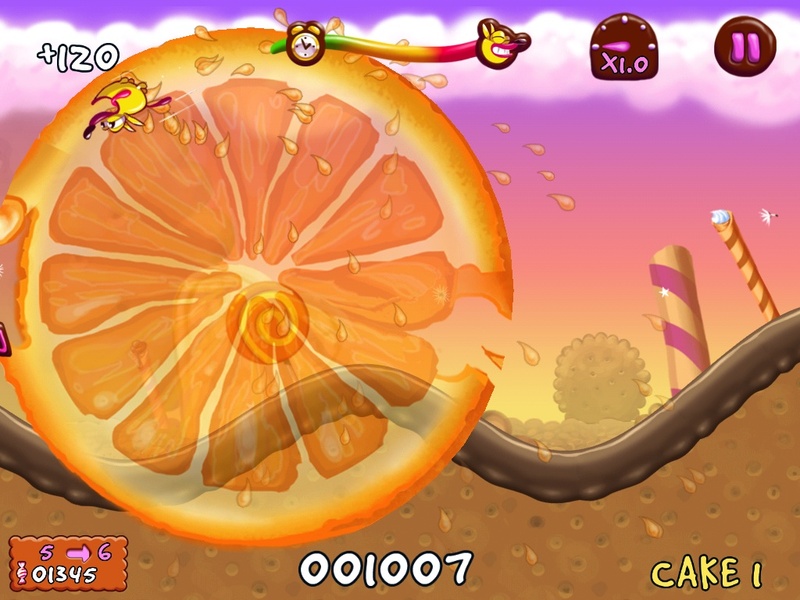 Throughout the level, there are pieces of candy, small green monsters, and rings of fruit. Knocking down monsters or eating candies adds to your sugar level, which can reach all the way to 10. Entering fruit causes the dog to flip around before being thrown out into the air. 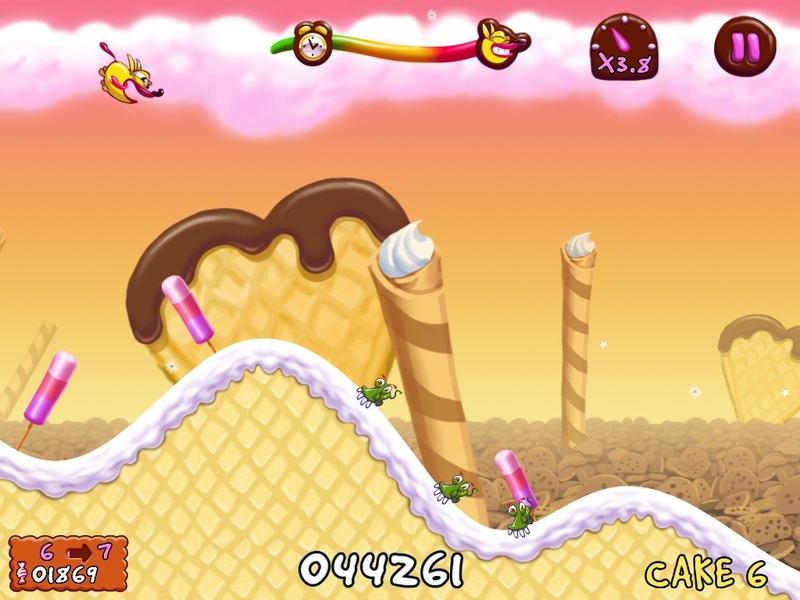 Performing perfect jumps too will add to your sugar level. Once it reaches 10, you obtain a sugar high. The point of all this is to make it as far as possible before a clock-faced monster catches up and eats the dog. Writing the description of the game, or even having read it, it may appear that Sugar High has too many elements. This is not the case, each of these parts seamlessly work together, making for a particularly fluid gaming experience. I really enjoyed the visual style of Sugar High. The worlds are hyperbolic and dreamy and all have unique colour schemes that fit within the overall theme of the game itself. The dog is well designed and just adorable. Little touches like fruit juice coming out of fruit slices and the dog looking at you when they fly really adds to the game over all. I particularly like the surprise interactivity of the dog in the main menu screen. I had a small glitch with the audio initially where there seemed to be no sound effects, but once I replayed the game I was taken by the small howls of the dog and the well-designed soundtrack. Overall, Sugar High is a fantastic execution of a rather simple idea. The game is incredibly addictive and I even found myself playing half-heartedly as I walked down the street. Those in the market for casual games will be captivated by this delightful title. 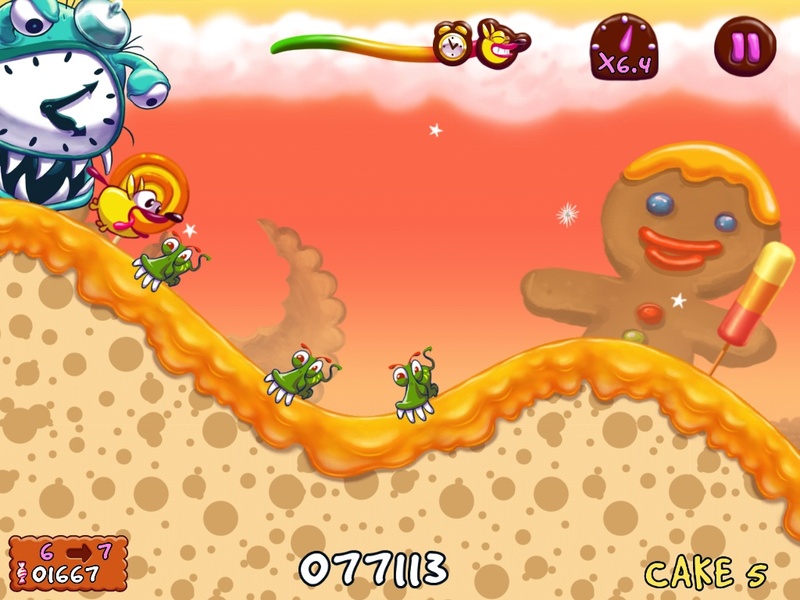 With its pick-up-and-play game design and charming audiovisual elements, Sugar High is sure to impress any iOS user.